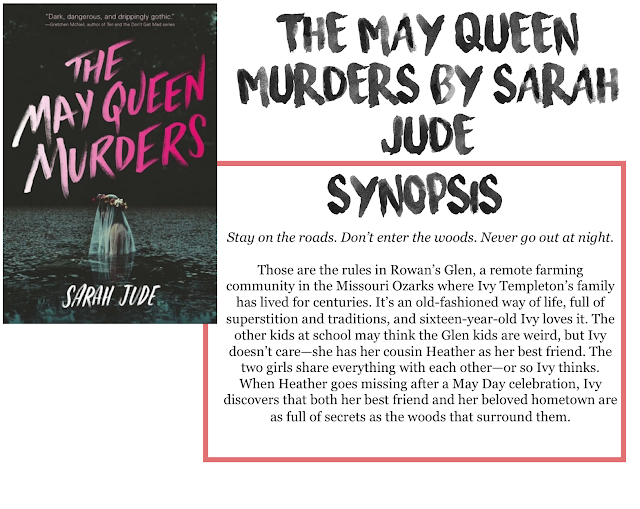 I am back with another review,w, today I am reviewing The May Queen Murders by Sarah Jude. Thanks so much to Raincoast Books for sending me a copy of this book for an honest review. All opinions are my own. Where do I start? This book truly was a whirlwind. When I first read the synopsis, I thought I was getting a story of a small town with a couple of murders. What I ended up with was a crazy, twisted story of a cult-like community (using cult in the sense of a small group of people with similar beliefs, not in a necessarily negative sense). Storywise, I enjoyed this book. The characters were interesting and the writing was good. I just feel like it could have been better. I feel like for the first 100 or so pages in this under-300 page book weren't really all that important. Yes, there was backstory, but the real mystery didn't really start until after that. Once everything picked up, I enjoyed it. But I just felt like for a book that's only 286 pages, the first third shouldn't be poorly done. In terms of the characters, I enjoyed them for the most part. Ivy and her family were interesting enough, but I felt like her codependence on first Heather and later Rook was annoying. I understand that they were close, but without Heather, Ivy didn't know how to be a person. I think the main thing I enjoyed about this book was the ending. Everything was built towards one person being guilty and I was so sure. But then that theory was disproved and a new one came to light. That happened a couple times and I don't know if it was because not much happened in the first half or what but I didn't mind being jerked around. In the end, this was an interesting book, but not one I personally will be picking up for my library.